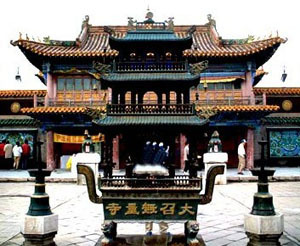 Dazhao Temple (dà zhào sì 大召寺) is the oldest and largest temple in Hohhot (hū hé hào tè 呼和浩特). 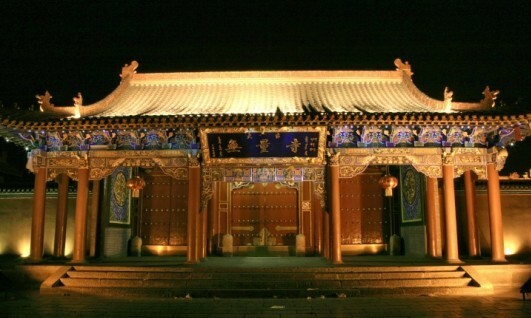 It is located in the old part of Hohhot and was built in 1580 during Ming Dynasty (míng cháo 明朝). Usually, the local people call it Yinfo Temple (yín fó sì 银佛寺) (Silver Buddha Temple) because there is a rare silver statue of Sakyamuni (the founder of Buddhism) with 2.5-meter-high. The Dazhao Temple is called Yikezhao (yī kè zhào 伊克召) Temple in Mongolian and means large temple. The original name was the Hongci Temple (hóng cí sì 弘慈寺) in Han Dynasty when it was completed to enlarge. In the temple the statue of Sakyamuni was made of silver entirely, so the Hongci Temple is also called the Silver Buddha Temple by local people. It is called Wuliang Temple (wú liàng sì 无量寺) since Qing Dynasty (qīng cháo 清朝) after the reconstruction in 1640. The Temple was originally built in the Han Dynasty. It was completed in 1580 during the Ming Dynasty (1368 - 1644) and is the oldest Lama Buddhist temple in Inner Mongolia. It went through a major reconstruction in 1640, but much of the original architectural style was retained. 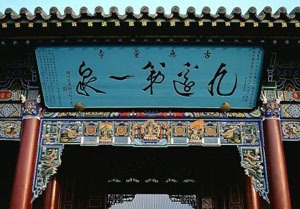 In Kangxi (kāng xī 康熙) Year of Qing Dynasty about in 1700, the temple was rebuilt again. The roof of the main hall was changed to pave yellow glazed tiles. After rebuilt, the Temple became very beautiful and full of Tibetan Buddhist color. Dazhao Temple owns its fame to a visit by the third Tibetan Dalai Lama in 1586, when he came to dedicate the Silver Buddha statue. As a consequence Hohhot became a religious center for people from all over Mongolia who came to worship at the temple. Another notable event in the temple's long history was a visit by Emperor Kangxi during the early part of the Qing Dynasty (1644-1911 AD). After his soujournment, a few days, the temple was dedicated to him, and a gold tablet proclaiming in characters "Long Live the Emperor" was set before the silver Sakyamuni. In respect to this imperial favour, from this time onwards the temple also became one of the few in the province that nullified the practice of choosing a new living Buddha after the old had passed away. The temple is well-known for the impressive buildings, splendid statues, delicate murals, musical instruments and fine collection of Buddhist scriptures among which the most notable are the "Three Marvelous Treasures"- the Silver Buddha, the carved dragons on the huge golden pillars on either side of the statue and the murals commemorating the Emperor's visit. Except for the main hall, the existing buildings within the temple complex are nearly all in the Han style. The main hall is a lamasery combining both Tibetan and Han styles of architecture. It has three parts. The front part is a two-story hall with an empty pavilion in the first floor; Jing Tang (jīng táng 经堂) (the hall for chanting) and Fo Tang (fó táng 佛堂) (the hall for worshiping Buddha) are central and rear sections. The perfectly preserved Silver Buddha lies in Fo Tang. 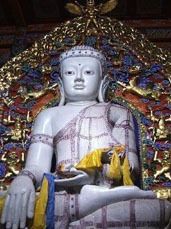 The Buddha stands 2.55 meters high and it has a history of about four hundred years. Before the statue there are a couple of gold wooden huge pillars, each engraved with a dragon. In front of the hall there are a couple of hollow stone powerful lions. Passing the main hall, you can see it still has passing hall, east and west side halls, scriptures building, the nine-room building and etc. Just in front of the temple, there is a well whose water tastes cool and fresh, and it wins the reputation as the best spring in the region. How to Get There: It is just 15 minutes' walk south of the Great Mosque, along Tongdao Street (tōng dào jiē 通道街) to Danan Street (dà nán jiē 大南街). The temple is then off to your right, down a small lane. Or take NO.1 bus, and stop at Armed Police Hospital (wǔ jǐng yī yuàn 武警医院) Stop.